Downey Plumbing, Heating and Air Conditioning offers a wide range of plumbing, HVAC and remodeling services. We understand having problems with your plumbing, heating, or air conditioning can be a big disruption. Our expert technicians are fully trained to be able to handle any issue that may arise in your residential or commercial property. Our customers in Downey are our neighbors and we want the best for them, their residences, and their businesses. Call us today to schedule an appointment – we are right around the corner! Receive $15 off any service in the city of Downey! Every homeowner has thought about the kitchen or bathroom of his or her dreams. Downey Plumbing knows how to make those dreams become a reality. 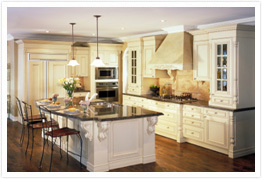 We will work with you directly to develop a remodeling plan for kitchens or bathrooms. Once we have the plans in place we will work with you to determine what materials, fixtures, lights or custom cabinets you want in your kitchen or bathroom. We will then create a plan to begin your remodeling project with as little disruption to your home and life as possible. From the design stage to putting on the finishing touches, Downey Plumbing contractors provide you with the expertise you need to have your remodeling project done from start to finish. Call Downey Plumbing today for your kitchen or bathroom remodel project in Southern California. We will send out a highly qualified remodeling expert to work with you to understand your vision of the ideal kitchen or bathroom. We will then work with you to determine what your budget is and how to make your dreams a reality within that budget. FYI: Downeys #1 24 hour plumbing service Sump Pump Tips: A basement sump pump can be of either manual or automatic type.